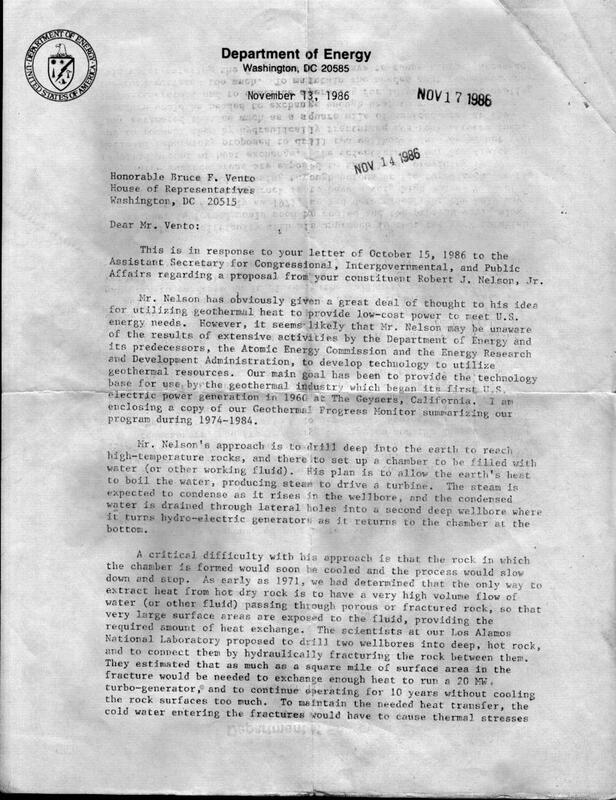 I still have my original submission papers to the U.S. Department of Energy for this one. 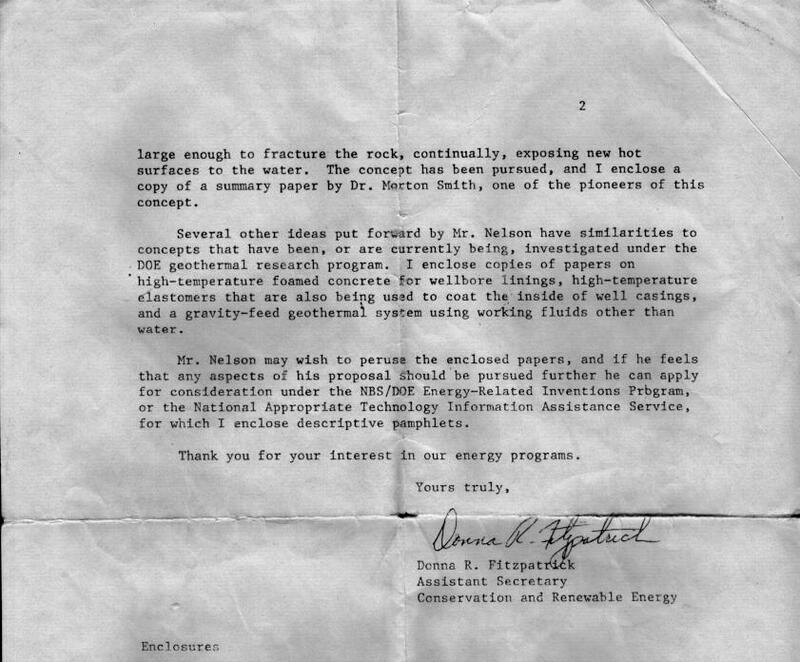 The scanned documents below are but a small fraction of the original documentation. Through their actions, the DOE admits that I independently invented it, and I have the paperwork to prove this. If it were not an original invention, it could not have made it into second stage evaluation, but it did. I still ahve the original idea / invention submission papers that clearly show that the checking for originality is completed in first stage evalualtion, before an idea can be passed to second stage evalution. In the first stage of their appraisal of a submitted idea, the invention must meet two criteria before it passes to second stage evaluation. First, it must be a valid and at least seemingly workable concept at a first rudimentary appraisal. Second, it must be unique, something not researched before. To verify the second criteria, the DOE does a patent search, and searches it own internal records, as well as those of related DOE funded research facilities. My submission passed into the second stage. The third stage is actual research funding. Mine did not make it there, but there is a reason for this which is explained later. Don't believe me, ask US Representative Bruce Vento (D-MN), whose office handled the submission to the DOE in 1986 and all related correspondence. Conoco also received the concept in 1986, as did Phillips Petroleum. The basic concept is to drill a deep bore into the earth, perhaps two miles deep, using a horizontal 12 foot diameter tunnel boring machine modified for vertical boring. Simple concept. Dump working fluid down the hole (water, b.p. 100 degrees C, or Carbon Tetrachloride, which boils at 79 degrees C). The working fluid boils, the steam rises, condenses on the walls, runs back down the walls into high capacity holding tanks (to keep the pressure up) and then through high pressure nozzles at the bottom of the tanks to turn tubine generators to produce electricity as it falls back down to the bottom of the hole. One drop of working fluid falls past many holding tanks and generators on it's trip back to the bottom of the hole. This awesome setup taps heat directly out of the core of the earth, a never ending supply, since heat at the earth's core is generated mostly by gravitational friction between the earth, moon, and sun, and to a lesser degree, radioactivity at the core. This heat is translated to physical, mechanical movement of the molecules of working fluid, which rise as a result. Therefore, this device is a modified Stirling Cycle engine (steam engine). Ask your local junior High School science teacher whether it works or not. The DOE denied third stage funding for it. The DOE moron sent back that while the concept was valid, the entire area would cool down soon enough and the device would cease functioning. I wrote him back that while this was true, it only indicated ignorance of the basic laws of thermodynamics on his part. (Although I didn't insult him). I said there are two choices. Either be impatient, and drill deeper, and it would start working again. Then it would cool again, and you would have to drill deeper again. I said that after at most 6 or 7 drilling / cooling cycles, a conduction current of heat would have become established, which would then be self perpetuating. I pointed out the known fact that once a conduction current of heat becomes established, it will remain self perpetuating, so long as the thermal gradient between source and drain is maintained. I pojnted out the alternate, to just wait, and slowly but surely, the conduction current would establish itself, and the device would begin functioning again, and then there would be a number of cool down / heat up cycles, with the cool portion becoming shorter and shorter each time until the conduction current was built up to its full potential. My analysis said that the device is capable of removing heat from the earth far faster than the earth can initially supply it, but also recognized the fact that one does not build up a conduction current instantaneously. My analysis was and is correct. Look at the Homestake Gold Mine, in South Dakota, home of the US Solar Neutrino research laboratory. This is the largest and deepest gold mine on the face of the earth. At a depth of 2 miles, the temperature never falls below 160 degree F, although the mine operators have been air conditioning and ventilating that depth for more than 30 years. Look at Old Faithful geyser in Yellowstone Park, which removes heat from the earth at a rate which dwarfs that of this type of geothermal power plant. 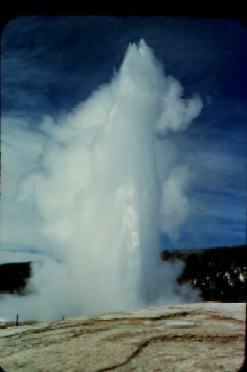 If what the retard at the DOE said were true, then Old Faithful would have stopped erupting shortly after it was first discovered, but fact shows that the eruptions are actually coming closer together now than in the past, losing a fraction of a second between eruptions annually, which means that the entire area is heating up, not cooling down. If what the retard at the DOE said were true, then a single ice cube placed at the core of the earth would cool down and solidify the entire molten core of the earth. The fact is, this type of power plant could only be allowed to operate for at most one or two thousand years, and then it would have to be shut down. Otherwise, the heat conduction current would become so powerful that it would form a fumarole, and eventually a volcano.